A washing machine is a reliable home appliance almost by all households in the present day situation. When you face any washing machine problems, quickly contact our customer care and one of our technicians will be at your doorstep within the stipulated time to Service your needs. Our technicians have deep knowledge of the appropriate methods to apply when your washing machine malfunctions. We are experts in fixing your washing machine, no matter what brand it is. 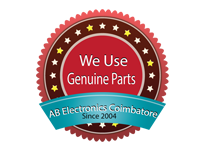 We assure that we will provide service with best price in Tirupur. We have genuine spare parts for all major brands of Washing Machine. AB Service aims at providing best repair service for all major Washing Machine brands. Our services are available for both domestic as well as commercial usage. We maintain a team of expert service engineers capable of handling any type of repairing service in Washing Machine. A washing machine is a reliable home appliance to wash the clothes with no much strain and effort from the human side. But, what if your washing machine breaks down all of a sudden. You might feel having lost a huge helping hand. To help you out in such situations, we at AB services offer service and repair solutions for your washing machines. We offer services at a competitive price, also render timely and efficient service for your washing machines. We have experienced, courteous and highly professional engineer to provide a full range of appliance repair work at the highest standards. Our technicians have deep knowledge of the appropriate methods to apply when your washing machine malfunctions. We fix any type of repairs for all brand washing machine. It’s Not About Machine; It’s All About Customer Happiness and Satisfaction! Notice too much vibration while operating your machine. When you feel a burnt smell while the machine is in operation. The improper functioning of the timer. Other problems like the washer are not spinning, you get too much noise while operating, water is not getting drained, water overflows.